Background: The present study was conducted to evaluate the bond strength in the different root thirds (premolars and maxillary central incisors) of composite relined glass fiber posts compared to untreated glass fiber posts cemented with dual- or chemical-cure cements. Materials and Methods: Sixty human single-rooted premolars (flat canal) (n = 15) and 12 maxillary central incisors were used (round canal) (n = 3). The teeth were sectioned, and the roots received endodontic treatment. The standardized preparation of the canals was carried out, and the roots were randomly divided into four groups according to the cementation systems: G1: cemented posts (dual: Ambar/Allcem); G2: relined posts (dual: Ambar/Allcem); G3: cemented posts (chemical: Fusion Duralink/Cement Post); and G4: relined posts (chemical: Fusion Duralink/Cement Post). The roots were cut to give two slices of each third of the root canal per specimen. Push-out test was conducted at a speed of 0.5 mm/min. Data were analyzed by analysis of variance and Tukey's post hoc test (α = 0.05). Results: There was no statistically significant difference between groups for the premolars (flat canal) (P = 0.959). There was a significant difference in the central incisors between the middle and apical thirds in the cemented group when using the dual system (P = 0.04) and between the middle and apical thirds (P = 0.003) and cervical and apical thirds (P = 0.033) when using the chemical system. Conclusion: Due to the anatomy of the root canal, flat canal of the premolars does not require relining, but round canal of the maxillary central incisors demands it for more secure in the bond strength. Many endodontically treated teeth have greater loss of tooth structure, due to previous restorations, invasive carious lesions, or removal of the tooth structure due to the endodontic access. The glass fiber posts have been universally accepted as a method of promoting increased strength when restoring an endodontically treated tooth. However, obtaining an effective adhesion to the root canal walls is a challenge, considering the unfavorable geometry and limitations inherent to the physicochemical properties of the adhesive material. Despite their clinical success, concerns have been raised on the effective capability of these resin-based materials to bond the fiber posts to root dentin, due to the unfavorable C-factor of the postspace. During the filling phase, the intimate contact of resin materials to the dentin of the root canal should ideally result in an excellent chemical–mechanical link. Attempts to improve adhesion, using either anatomical glass fiber posts or glass fiber posts that have been relined with a composite resin, have been indicated as a possible alternative for reducing the thickness of the resin cement layer. The push-out test is an established and frequently described method in the literature to evaluate bond strength of posts luted to intraradicular dentin. Well-known factors possibly explaining the relatively high standard deviation of the results in the model are the unavoidable anatomical variations and heterogeneity of the substrate among teeth. Given this context, the aim of this study was to analyze the bond strength in the different root thirds (premolars and maxillary central incisors) of glass fiber posts relined with composite resin compared to untreated glass fiber posts cemented with dual- or chemical-cure cements. The current study utilized a total of 60 single rooted human premolars and 12 maxillary central incisors, obtained from the Tooth Bank of Tuiuti University of Paraná. The study was approved by the Brazil Platform no. 309.060. The teeth were radiographed, and specimens were excluded if they had root lengths of <15.0 mm, atypical or multiple root canals, and previous endodontic treatment. The outer root surface was cleaned using an ultrasonic apparatus (Kavo, Joinville, SC, Brazil), and then, the specimens were embedded in 1% NaOCl solution for 10 min and washed in running water. The crowns were sectioned at the cementoenamel junction (CEJ) using a diamond disc (KG Sorensen, Barueri, Brazil) under water irrigation, and the root length was standardized at 15.0 mm. Coronary access was performed using #1014 and #3080 diamond burs (KG Sorensen, Barueri, Brazil) at high speed (KaVo, Joinville, SC, Brazil). Canal debridement was carried out using #15 and 20 K-Flexofiles (Dentsply Maillefer, Ballaigues, Switzerland). The root canal length was measured by inserting a file into the canal until the tip became visible at the apical foramen. The working length was determined by subtracting 1 mm from this length and established at 14.0 mm. The root canals were shaped using #25 and 50 Reciproc files (VDW, Munich, Germany), which were established as the maximum apical extension file. During the chemical–mechanical preparation, irrigation was performed using 2.0 mL of 2.5% sodium hypochlorite after each instrument. The prepared canal was irrigated using 5.0 mL of 17% ethylenediaminetetraacetic acid (EDTA) that was left in the root canal for 5 min and then a final irrigation with saline solution. The canals were dried using paper points (Dentsply/Maillefer, Petrópolis, Brazil) and filled with the single-cone technique using #50 Reciproc gutta-percha and AH Plus endodontic sealer (Dentsply, Konstanz, Germany). All materials were used in accordance with the manufacturer's instructions. Gutta-percha was removed using #2 and 3 Peeso burs (Maillefer, Ballaigues, Switzerland), leaving 6.0 mm as an apical seal. The postspace was then prepared using a low-speed bur provided by the Whitepost DC Kit (FGM Dental Products) to the same depth. The samples were randomly divided into four groups (n = 15): G1: Cemented (Ambar-adhesive system/All Hundred-dual resin cement); G2: Posts relined with composite resin (Opallis) and cemented (Ambar-adhesive system/All Hundred-dual resin cement); G3: Cemented (Fusion Duralink-adhesive system/Cement Post-chemical resin cement); and G4: Posts relined with composite resin (Opallis) and cemented (Fusion Duralink-adhesive system/Cement Post-chemical resin cement). The material compositions used in this study are shown in [Table 1]. The study was also conducted in central incisors with the same variables described above (n = 3). The glass fiber post utilized in the current study was white DC Post (FGM, Joinville, Brazil). Each canal of the G1 specimens was etched with 37% phosphoric acid (Dentsply) for 15 s, washed for 30 s, and dried with absorbent paper points (Dentsply). Two layers of the Ambar adhesive system (FGM Dental Products, Joinville, Brazil) were applied using a microbrush for 10 s each. An airstream was applied, and the excess adhesive was removed using a clean microbrush. Polymerization was carried out for 20 s using a halogen light unit with an intensity of 800 mW/cm 2 (XL 3000, 3M ESPE). The post was cleaned with 70% alcohol, conditioned with 37% phosphoric acid (Dentsply) for 15 s, rinsed, and dried with a gentle stream of air. Two coats of the silane agent (Prosil, FGM Dental Products) were applied and allowed to sit for 1 min. A layer of the Ambar adhesive system (FGM, Joinville, Brazil) was applied and polymerized for 20 s. The dual-cure resin cement (Allcem, FGM Dental Products) was inserted into the canal using a lentulo spiral drill (Dentsply/Maillefer) in a handpiece at low speed. The post was fixed in root canal, and excess cement was removed after 3 min. The resin cement was cured for 40 s using a halogen light unit positioned at the neck portion of the post. The G2 posts were cleaned with 70% alcohol and then conditioned with 37% phosphoric acid (Dentsply) for 15 s, rinsed, and dried with compressed air. Two layers of silane agent (FGM Dental Products) were applied and allowed to sit for 1 min. A layer of the Ambar adhesive system (FGM Dental Products) was applied and polymerized for 20 s. After lubricating the walls of the channel with water, a layer of opaque microhybrid Opallis A4 composite resin (FGM Dental Products) was applied, and the post was inserted into the root canal. The resin was light cured for 10 s, removed from the root canal, and light cured for 10 s. After verifying the fit of the relined post, it was light cured for 40 s. The etching, application of the adhesive system to the relined post and the root canal, and cementation of the post were carried out as with the specimens in G1. The root canals of the G3 specimens were etched with 37% phosphoric acid (Dentsply) for 15 s, rinsed for 30 s, and dried with absorbent paper points (Dentsply). The Fusion Duralink primer (Angelus, Londrina, PR, Brazil) was applied using a microbrush for 20 s; gentle jets of air were applied for 10 s and the canals were dried using absorbent paper points (Dentsply). The chemical adhesive catalyst, Fusion Duralink (Angelus, Londrina, Brazil), was applied using a microbrush. The posts were cleaned with 70% alcohol, etched with 37% phosphoric acid (Dentsply) for 15 s, washed, and dried with a gentle stream of air. Two layers of a silane agent (Prosil, FGM Dental Products) were applied and allowed to sit for 1 min. The chemical adhesive catalyst, Fusion Duralink (Angelus), was then applied. The chemically activated resin cement (Cement Post, Angelus) was inserted as previously reported, and the post was fixed in the root canal. Excess cement was removed after 3 min. Relining of the post in G4 was performed as described for G2. The etching, application of the adhesive system for the relined post and the root canal, and cementing of the G4 post were performed as previously described for the G3 specimens. One week after cementing the posts, the roots were inserted in polyvinyl chloride pipes filled with crystal resin RPF (House of Silicone, Curitiba, PR, Brazil). The samples were sectioned transversely to the long axis in a sectioning machine (Isomet 1000, Buehler, Lake Bluff, Illinois, USA) to obtain 1.0 mm thick slices. Two sections from each root canal third were obtained per specimen, corresponding to the cervical, middle, and apical thirds. Before the push-out test, the slices were photographed (Nikon D5100 Digital Camera, Tokyo, Japan, equipped with a Nikon 105 mm macro lens) on both sides, using a ×40 magnification optical microscope (Olympus, BX 51 model, Olympus, Tokyo, Japan) to measure the diameters of the coronal, middle, and apical thirds of cemented and relined posts, to calculate the bonding area for each section. This measurement was performed using the Image Tool software, version 3.0 (Department of Dental Diagnostic Science, University of Texas Health Science Center, San Antonio, Texas, USA). Next, the specimens were submitted to push-out strength testing. Each sample was placed with its crown portion positioned facing down on a metal device with a small central opening, such that the load exerted a constant compressive force in an apical–coronal direction to promote dislodgment of the post. The actuator was positioned at the center of each post fragment, such that the applicator tip only touched the posts. The specimens were tested in a universal testing machine (AG-I, Shimadzu Autograph, Tokyo, Japan), using a load cell of 50 kg and a crosshead speed of 0.5 mm/min until displacement of the fiber post. The load at failure was recorded in Newtons (N) and converted to a bond strength in MPa by dividing the load value (N) by the value of the adhesive area (mm 2). The adhesive area (SL) was estimated by the formula used to calculate the lateral surface area of a truncated cone: SL = π (R + r) ([h 2+ (R – r]2)0.5, where π is the constant 3.1416; R is the radius of the coronal aspect of the post (mm); r represents the radius of the apical aspect of the post (mm), and h is the thickness of the specimen (mm). The results were statistically analyzed. The bond strength values obtained for the premolars passed the normality tests (Kolmogorov–Smirnov test and Shapiro–Wilk test); therefore, the data were submitted to analysis of variance (ANOVA) and Tukey's post hoc test (α = 0.05). However, due to the smaller sample size, the bond strength values for the pilot study (the maxillary central incisors) did not pass the normality tests; therefore, the nonparametric Kruskal–Wallis test was used. The SPSS software, version 20.0 (SPSS, IBM Corporation, Somers, NY, USA), was used to perform all statistical analyses. A scanning electron microscope (Shimadzu, Kyoto, Japan) was used to view the fracture patterns of the samples. Selected slices from each group were washed with a 95% alcohol solution for 1 min and dried with air jets. The samples were fixed on a metal sample holder and sputter coated with gold-palladium (Shimadzu, Kyoto, Japan). Each slice was examined using scanning electron microscopy (SEM) (Shimadzu, Kyoto, Japan) with 15 kV and magnifications of ×50 and ×100. The mean values and standard deviations of the bond strengths for the premolars are presented in [Table 2] and the maxillary central incisors in [Table 3]. There was no statistically significant difference between groups for the premolars based on the ANOVA (P = 0.959). 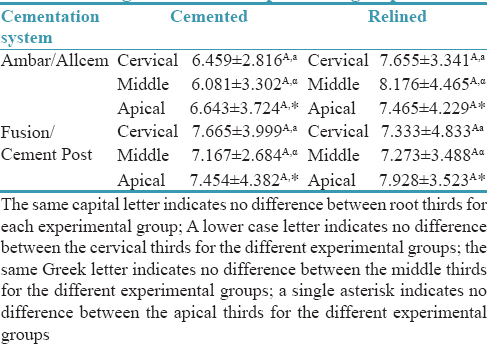 The maxillary central incisors showed a statistically significant difference between the middle and apical thirds of in the cemented group for the dual-cure system (Ambar/Allcem) (P = 0.04) and between the middle and apical thirds (P = 0.003) and cervical and apical thirds (P = 0.033) for the chemical system (Fusion/Cement Post) in the cemented groups. There were no significant differences between the root thirds when comparing the dual- and chemical-cure systems for the reline technique (P > 0.05). The Kruskal–Wallis analysis of the maxillary central incisors indicated that the chemical-cure cemented group was statistically different when compared with the dual-cure (P = 0.049) and chemical-cure (P = 0.003) relined groups. With regard to the middle third of the different experimental groups, the chemical-cure cemented group was statistically different from the dual-cure (P = 0.003) and chemical-cure (P = 0.003) relined groups. With regard to the apical third of the different experimental groups, the dual-cure cemented group was statistically different from the dual-cure (P = 0.004) and chemical-cure (P = 0.010) relined groups, while the chemical-cure cemented group was statistically different from the dual-cure (P = 0.003) and chemical-cure (P = 0.003) relined groups. SEM images, representing the major types of failures observed at the bonding interface, are shown in [Figure 1],[Figure 2],[Figure 3]. After endodontic treatment, many teeth have a great loss of tooth structure. Glass fiber posts have been indicated as an alternative for improving the strength of the restored tooth while reducing the risk of postfracture seen with cast posts.,,,,,,, The reduced risk of root fracture is due to the glass fiber post having an elastic modulus similar to dentin. In addition, an adhesive connection between the post/cement/dentin is produced when bonding glass fiber posts, reducing stresses in the remaining root, and favoring retention of the post in the root canal. Studies suggest that a thick layer of resin cement around a post decreases the bond strength of the post/cement/dentin interface., In an attempt to improve the adaptation of the glass fiber post to the root canal to reduce the thickness of the resin cement and improve the adhesive strength, relined glass fiber posts have been proposed.,,, Alsamadani et al. compared various restorative treatment techniques and concluded that glass fiber posts relined with a composite resin increased the fracture strength of teeth with weakened roots. In light of these results, the present study compared the bond strength of conventional glass fiber posts to relined glass fiber posts, varying the cementing systems using dual-cure or chemical-cure cements. The current study used extracted human premolars and maxillary central incisors, with both groups having their crowns removed at the CEJ.,, The root canals were irrigated using 2.5% NaOCl ,,, and 17% EDTA. The literature has shown the effectiveness of these irrigants in removing the smear layer. Pelegrine et al. evaluated different concentrations of NaOCl (1%, 2.5%, and 5.25%) associated with 17% EDTA, concluding that there was no influence on the tensile strength when using a self-etching adhesive system. However, Vilanova et al. found the highest bond strengths of composite resin to dentin when associating 1% NaOCl with 17% EDTA. Wu et al. showed that irrigation with 3% NaOCl and 17% EDTA was effective in removing the smear layer but presented limitations in the apical third. This limitation may be related to the lower number of dentinal tubules in this region as well as the difficulty of penetration and flow of irrigating agents due to the reduced diameter of the apical third of the root canal. Several factors can affect the retention of glass fiber posts to root canal dentin, such as the time of preparation and cementation of the post, the post type and its adaptation to the prepared space, the type of sealer, the adhesive system, and the cementation procedures. Given the difficulties in adhesion, reducing the thickness of the resin cement layer and improving the adaptation of glass fiber posts appear to increase postretention. One study showed higher bond strength values when there was a smaller thickness of resin cement (0.1–0.3 mm) when compared to thicker layers. In addition to the improvement in postretention in the root canal, thinner layers of resin cement tend to lower blisters or cracks due to postpressure on the resin cement., The use of a lentulo spiral to insert cement into the root canal space is an effective technique for reducing voids and bubbles in the cement layer. Thus, this present study used a glass fiber post relined with composite resin to improve retention and decrease the thickness of the resin cement layer. The clinical procedures for the preparation of relined post are easy to perform and require only a few steps beyond those described for cementation of a conventional glass fiber post, enabling a better fit of the post to the root canal walls, thereby decreasing the thickness of the resin cement layer and formation of bubbles within the cement. In addition to reduced resin cement polymerization shrinkage due to the thin cement layer, another important factor is that the shape of the root canal is not as circular as the post; the use of a conventional post requires the spaces between the post and the root canal walls to be filled with the resin cement, thereby forming a thick layer. With the use of a relined glass fiber post, the cement layer would be thinner and more uniform, both of which are ideal conditions for retention. The relined glass fiber posts increased retention to the root canal and improved contact between the cement and the adhesive although the cement–dentin interface is still the weakest link in the cementation of these posts. Grandini et al. indicated good adhesion between the post and the relining resin. The use of relined glass fiber posts was also effective when used in weakened roots, improving the biomechanical behavior. The current results indicate that the experimental groups (with or without composite relining of the glass fiber post) did not differ in bond strength. However, the pilot study, which presented with wider root canals, indicated that the relining technique was more effective, achieving higher bond strength values. This present result can be explained by the root anatomy of the premolars being flattened in a mesiodistal direction, often creating a direct contact of the post with the root canal walls without the presence of, or at least a thin, resin layer. However, the incisors presented broader and more circular root canals, allowing for the resin to reline around the entire post, giving a thicker and more homogeneous layer. In addition to the chemical–mechanical preparation of the root canals, the use of sealers and gutta-percha can interfere with the adhesion of glass fiber posts. The root canals were filled with gutta-percha using the single-cone technique and AH Plus (a resin cement), which showed better results in bond strength when compared to a eugenol-based cement. Upon completion of the endodontic procedures, gutta-percha was removed from the root canals using Peeso burs, and the postspace was prepared using a bur from the fiber glass post kit. The root dentin was etched using 37% phosphoric acid, and excess water from rinsing was removed using paper points.,,, Faria-e-Silva et al. etched the canal dentin with 35% phosphoric acid while other studies used a concentration of 32%.,, Kahnamouei et al. compared three total-etch adhesive cements with three cements and concluded that the adhesive systems and total-etch resin cements showed uniform bond strength in different regions of the root canal. Total or conventional etching adhesive systems promote the formation of a thicker and uniform hybrid layer in the root canal and the formation of dense resin tags. With respect to the cementing systems, the results indicated a greater effectiveness for the dual-cure system when compared to the chemical-cure system in the pilot study although no statistically significant differences occurred between the experimental groups. This result can be attributed to the completion of the light curing. It is suggested that there were no significant differences in the experimental group due to the innermost contact of the post to the root canal wall, resulting in mechanical retention of the post, which may influence the displacement of posts during the push-out test. Within the limitations of this study, it can be concluded that there was no difference in bond strength for the premolar group, regardless of the restorative system. However, the maxillary central incisor group indicated greater effectiveness of bond strength for the relined posts and dual-cure cement when compared to the other groups, demonstrating greater influence of relining in relation to cementing, in the round canal. The use of a smaller sample size for the group of incisors was due to the lower availability of these teeth to study when compared to the premolars which are usually extracted for orthodontic reasons and is available in greater numbers to search after approval by the Ethics Committee. More studies about the influence of the cross section of the root configuration are required. Babb BR, Loushine RJ, Bryan TE, Ames JM, Causey MS, Kim J, et al. Bonding of self-adhesive (self-etching) root canal sealers to radicular dentin. J Endod 2009;35:578-82. Hashem AA, Ghoneim AG, Lutfy RA, Fouda MY. The effect of different irrigating solutions on bond strength of two root canal-filling systems. J Endod 2009;35:537-40. Jainaen A, Palamara JE, Messer HH. Effect of dentinal tubules and resin-based endodontic sealers on fracture properties of root dentin. Dent Mater 2009;25:e73-81. Akisue E, Tomita VS, Gavini G, Poli de Figueiredo JA. Effect of the combination of sodium hypochlorite and chlorhexidine on dentinal permeability and scanning electron microscopy precipitate observation. J Endod 2010;36:847-50. Mai S, Kim YK, Kim J, Yiu CK, Ling J, Pashley DH, et al. In vitro remineralization of severely compromised bonded dentin. J Dent Res 2010;89:405-10. Dai L, Khechen K, Khan S, Gillen B, Loushine BA, Wimmer CE, et al. The effect of QMix, an experimental antibacterial root canal irrigant, on removal of canal wall smear layer and debris. J Endod 2011;37:80-4. Nassar M, Awawdeh L, Jamleh A, Sadr A, Tagami J. Adhesion of Epiphany self-etch sealer to dentin treated with intracanal irrigating solutions. J Endod 2011;37:228-30. Schwartz RS. Adhesive dentistry and endodontics. Part 2: Bonding in the root canal system-the promise and the problems: A review. J Endod 2006;32:1125-34. Carvalho CA, Monticelli F, Cantoro A, Breschi L, Ferrari M. Push-out bond strength of fiber posts luted with unfilled resin cement. J Adhes Dent 2009;11:65-70. Costa JA, Rached-Júnior FA, Souza-Gabriel AE, Silva-Sousa YT, Sousa-Neto MD. Push-out strength of methacrylate resin-based sealers to root canal walls. Int Endod J 2010;43:698-706. D'Arcangelo C, Cinelli M, De Angelis F, D'Amario M. The effect of resin cement film thickness on the pullout strength of a fiber-reinforced post system. J Prosthet Dent 2007;98:193-8. Pelegrine RA, De Martin AS, Cunha RS, Pelegrine AA, da Silveira Bueno CE. Influence of chemical irrigants on the tensile bond strength of an adhesive system used to cement glass fiber posts to root dentin. Oral Surg Oral Med Oral Pathol Oral Radiol Endod 2010;110:e73-6. Bolay S, Öztürk E, Tuncel B, Ertan A. Fracture resistance of endodontically treated teeth restored with or without post system. J Dent Sci 2012;7:148-53. Silva GR, Santos-Filho PC, Simamoto-Júnior PC, Martins LR, Mota AS, Soares CJ. Effect of post type and restorative techniques on the strain and fracture resistance of flared incisor roots. Braz Dent J 2011;22:230-7. Akgungor G, Akkayan B. Influence of dentin bonding agents and polymerization modes on the bond strength between translucent fiber posts and three dentin regions within a post space. J Prosthet Dent 2006;95:368-78. Kahnamouei MA, Mohammadi N, Navimipour EJ, Shakerifar M. Push-out bond strength of quartz fibre posts to root canal dentin using total-etch and self-adhesive resin cements. Med Oral Patol Oral Cir Bucal 2012;17:e337-44. Grandini S, Goracci C, Monticelli F, Borracchini A, Ferrari M. SEM evaluation of the cement layer thickness after luting two different posts. J Adhes Dent 2005;7:235-40. Faria-e-Silva AL, Pedrosa-Filho Cde F, Menezes Mde S, Silveira DM, Martins LR. Effect of relining on fiber post retention to root canal. J Appl Oral Sci 2009;17:600-4. Grandini S, Sapio S, Simonetti M. Use of anatomic post and core for reconstructing an endodontically treated tooth: A case report. J Adhes Dent 2003;5:243-7. Alsamadani KH, Abdaziz el-SM, Gad el-S. Influence of different restorative techniques on the strength of endodontically treated weakened roots. Int J Dent 2012;2012:343712. Topcu FT, Erdemir U, Sahinkesen G, Mumcu E, Yildiz E, Uslan I. Push-out bond strengths of two fiber post types bonded with different dentin bonding agents. J Biomed Mater Res B Appl Biomater 2010;93:359-66. Vilanova WV, Carvalho-Junior JR, Alfredo E, Sousa-Neto MD, Silva-Sousa YT. Effect of intracanal irrigants on the bond strength of epoxy resin-based and methacrylate resin-based sealers to root canal walls. Int Endod J 2012;45:42-8. Wu L, Mu Y, Deng X, Zhang S, Zhou D. Comparison of the effect of four decalcifying agents combined with 60°C 3% sodium hypochlorite on smear layer removal. J Endod 2012;38:381-4. Gomes GM, Gomes OM, Reis A, Gomes JC, Loguercio AD, Calixto AL. Regional bond strengths to root canal dentin of fiber posts luted with three cementation systems. Braz Dent J 2011;22:460-7. Aleisa K, Alghabban R, Alwazzan K, Morgano SM. Effect of three endodontic sealers on the bond strength of prefabricated fiber posts luted with three resin cements. J Prosthet Dent 2012;107:322-6.